Al-Siq (Arabic: السيق‎) (translated: the shaft) is the main entrance to the ancient city of Petra in southern Jordan. 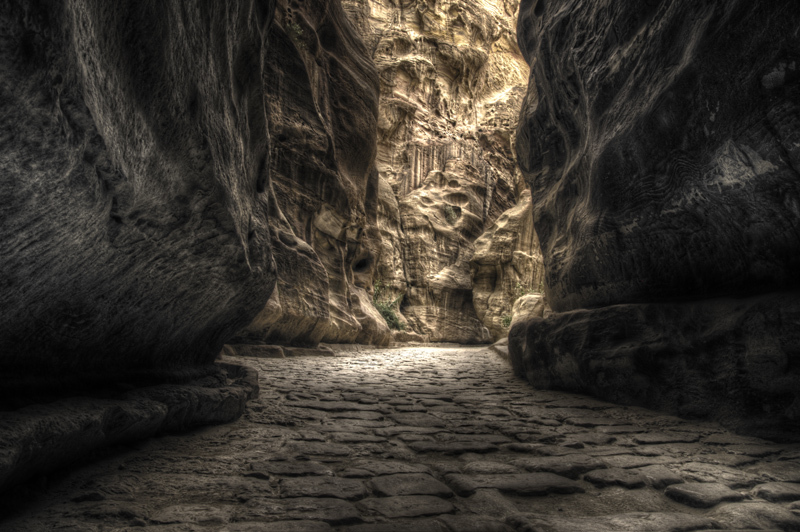 The dim, narrow gorge (in some points no more than 3 meters wide) winds its way approximately one mile and ends at Petra’s most elaborate ruin, Al Khazneh (The Treasury). The entrance to the Siq contains a huge dam, reconstructed in 1963 and again in 1991, designed to bar the mouth of the Siq and reroute the waters of Wadi Musa. The dam is a fairly true reconstruction of what the Nabataeans did to control Wadi Musa between the 1st century BC and the beginning of the 1st century AD. The entrance also contains the remnants of a monumental arch, of which only the two abutments and some hewn stones of the arch itself have survived. The arch collapsed in 1896 following an earthquake, but its appearance is known based on the lithograph works of David Roberts. The Siq was used as the grand caravan entrance into Petra. Along both walls of the fissure are a number of votive niches containing baetyli, which suggest that the Siq was sacred to the Nabatean people. In 1998, a group of statues were uncovered when digging was conducted to lower the road by more than six feet. Although the upper part is greatly eroded, it is still possible to recognize the figures of two merchants, each leading two camels. The figures are almost twice lifesize. Along the Siq are some underground chambers, the function of which has not yet been clarified. The possibility that they were tombs has been excluded and archaeologist find it difficult to believe that they were dwellings. The majority consensus is that they housed the guards that defended the main entrance to Petra.